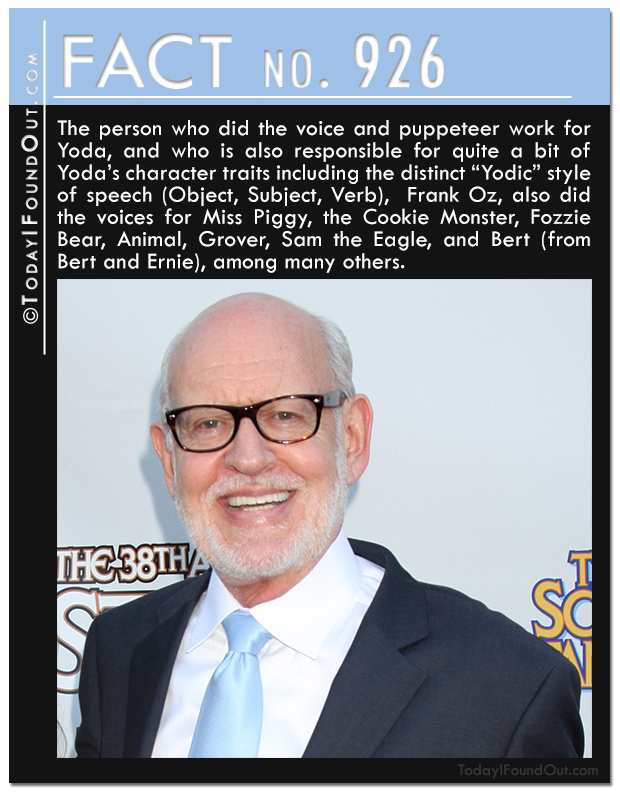 926) The person who did the voice and puppeteer work for Yoda, and who is also responsible for quite a bit of Yoda’s character traits including the distinct “Yodic” style of speech (Object, Subject, Verb), Frank Oz, also did the voices for Miss Piggy, the Cookie Monster, Fozzie Bear, Animal, Grover, Sam the Eagle, and Bert (from Bert and Ernie), among many others. 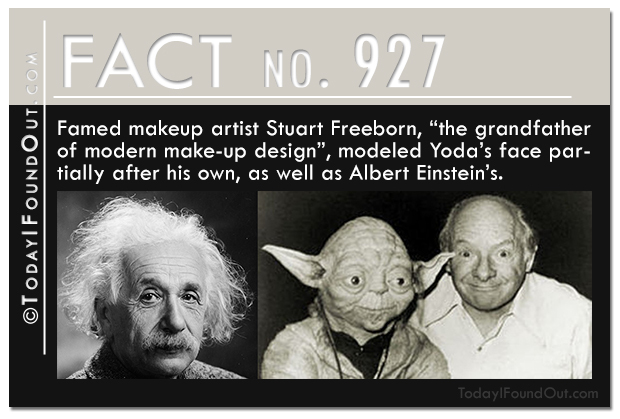 927) Speaking of Yoda, famed makeup artist Stuart Freeborn, “the grandfather of modern make-up design”, modeled Yoda’s face partially after his own, as well as Albert Einstein’s. 928) Contrary to C3P0’s estimates in Empire Strikes Back, it should actually be quite safe to fly through an asteroid field. The reality is that the objects in asteroid fields are generally hundreds of thousands of miles apart and most of them are no bigger than a tennis ball. For instance, if you added up the mass of all the asteroids in our solar system’s asteroid belt, it’s a mere 4% of the mass of our moon with about 1/2 of the total mass from just four asteroids- Ceres, Vesta, Pallas, and Hygiea. So that’s our asteroid belt. Could there be one out there that would be dangerous to fly through? Unlikely, unless it was formed extremely recently- the reason being that even if the asteroid belt is initially packed with debris that are colliding everywhere like what is depicted in Empire Strikes Back, this would relatively quickly (on a galactic time scale) sort itself out with most of the mass being ejected from the belt. Eventually, the system would stabilize itself to something like our asteroid belt. And if you’re thinking just now that maybe the Hoth Asteroid Belt was a newly formed phenomenon, it was actually described in the Expanded Universe as having been formed several million years before the events of Empire Strikes Back, via a collision of two rocky planets. 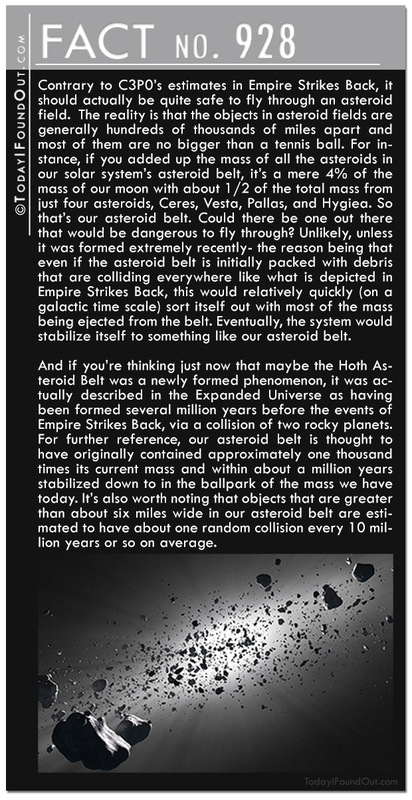 For further reference, our asteroid belt is thought to have originally contained approximately one thousand times its current mass and within about a million years stabilized down to in the ballpark of the mass we have today. It’s also worth noting that objects that are greater than about six miles wide in our asteroid belt are estimated to have about one random collision every 10 million years or so on average. 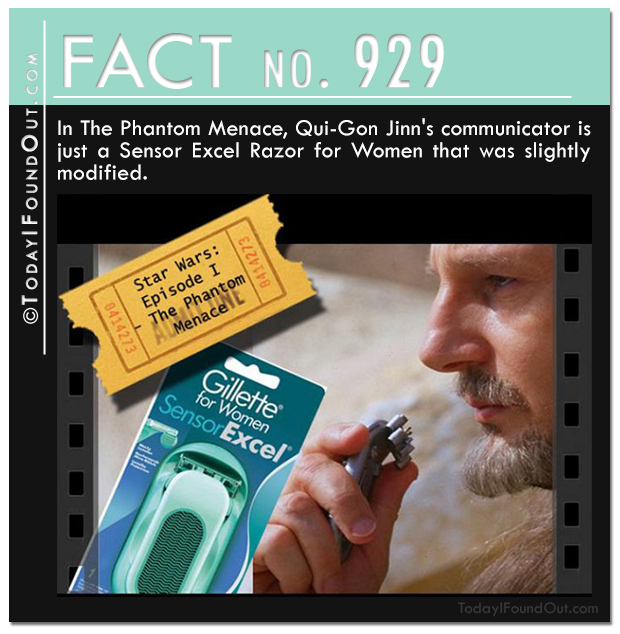 929) In The Phantom Menace, Qui-Gon Jinn’s communicator is just a Sensor Excel Razor for Women that was slightly modified. 930) According to Peter Mayhew, the actor who plays Chewbacca, during the filming of the Endor scenes, he wasn’t allowed to walk around the forest in costume without other people with him because the crew were concerned that he’d be shot by a hunter, perhaps mistaking him for Bigfoot. Ironically, in one very questionable Expanded Universe comic called, Into the Great Unknown, Chewbacca and Han Solo crash into a forest on Earth. 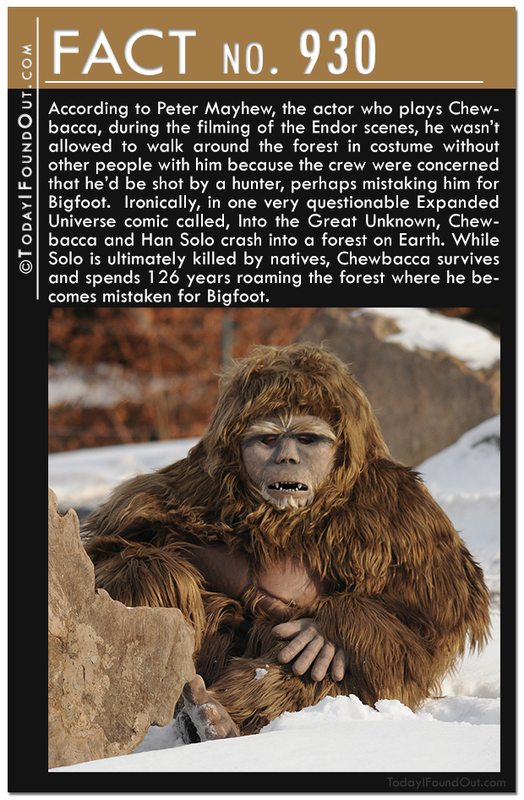 While Solo is ultimately killed by natives, Chewbacca survives and spends 126 years roaming the forest where he becomes mistaken for Bigfoot. 931) Warwick Davis, today best known for his roles in Harry Potter (most notably portraying Professor Flitwick) and the mockumentary Life’s Too Short, among many other works, got his start in show business at the age of 11 playing the Ewok Wicket in Return of the Jedi. Davis was originally just cast as an Ewok extra, but the actor who was going to play Wicket, Kenny Baker (who played R2-D2), got sick on the day of the shoot and Warwick was selected to take over. This was Davis’ big break as later Ron Howard and George Lucas would create the film Willow with Warwick Davis in mind to play the starring role, even though Davis was just 17 when they offered him the part and was playing a character who was depicted to be in his late 20s or early 30s. 932) The Ewoks were named after the Native American tribe Miwok who lived in the Redwood forest that is the setting for the Endor scenes on Return of the Jedi. 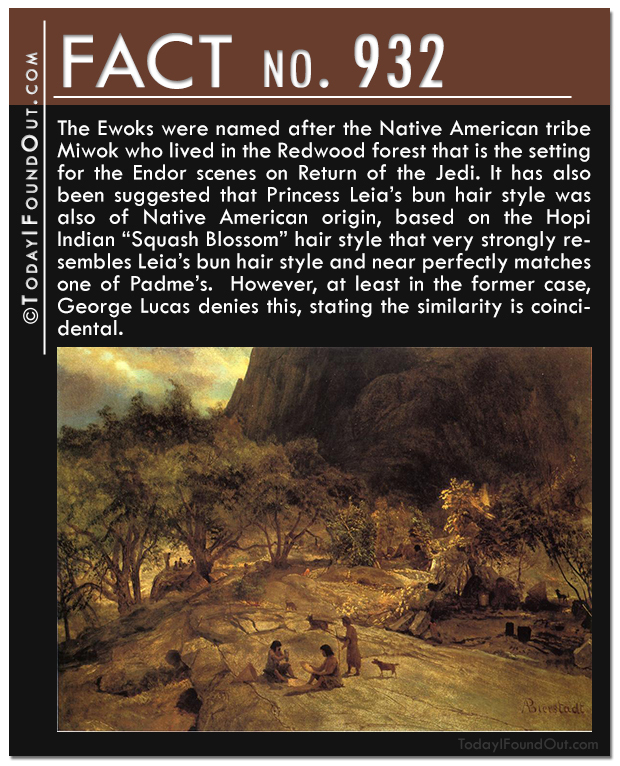 It has also been suggested that Princess Leia’s bun hair style was also of Native American origin, based on the Hopi Indian “Squash Blossom” hair style that very strongly resembles Leia’s bun hair style and near perfectly matches one of Padme’s. 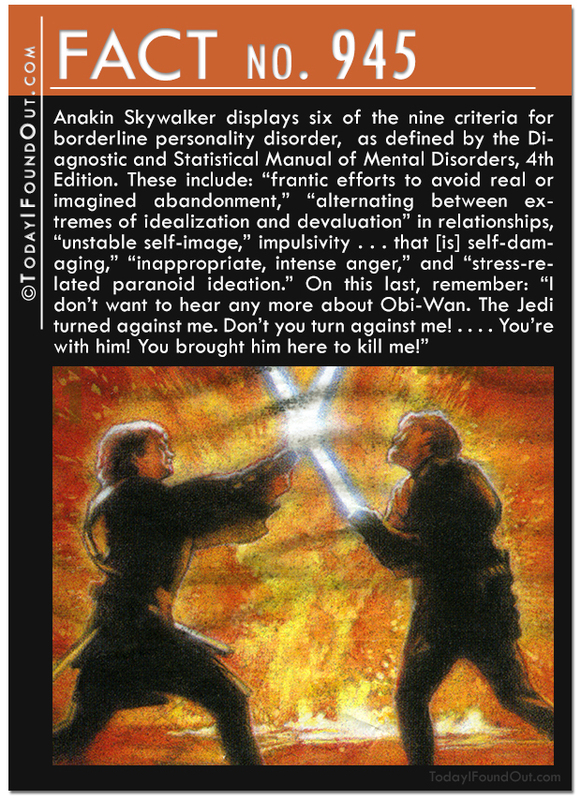 However, at least in the former case, George Lucas denies this, stating the similarity is coincidental. 933) Incidentally, the word “ewok” was never spoken in Return of the Jedi. 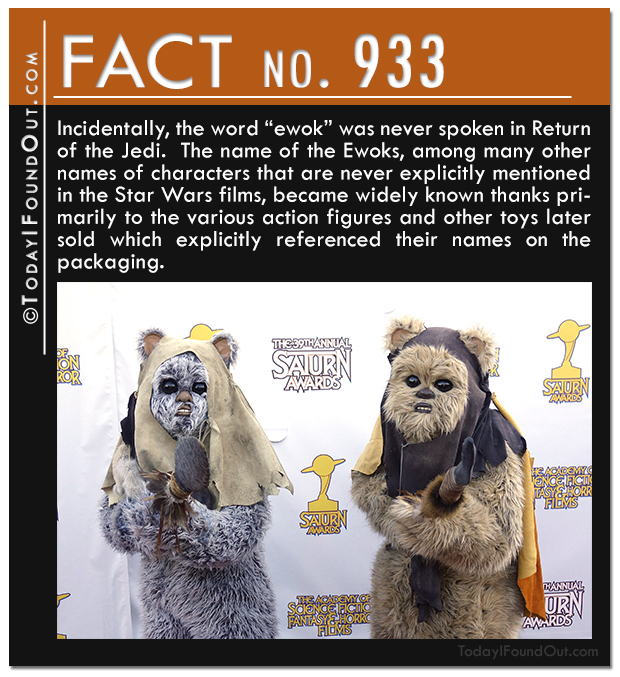 The name of the Ewoks, among many other names of characters that are never explicitly mentioned in the Star Wars films, became widely known thanks primarily to the various action figures and other toys later sold which explicitly referenced their names on the packaging. 934) The actor who played Count Dooku in Episode II and III, Christopher Lee, in partnership with guitarist Richie Faulkner of Judas Priest fame, created a heavy metal album released on Lee’s 91st birthday. The album is based on the life of Charlemagne. If you don’t find this odd enough, you should know that this wasn’t Lee’s first metal album. It also wasn’t his first music album on the topic of Charlemagne. 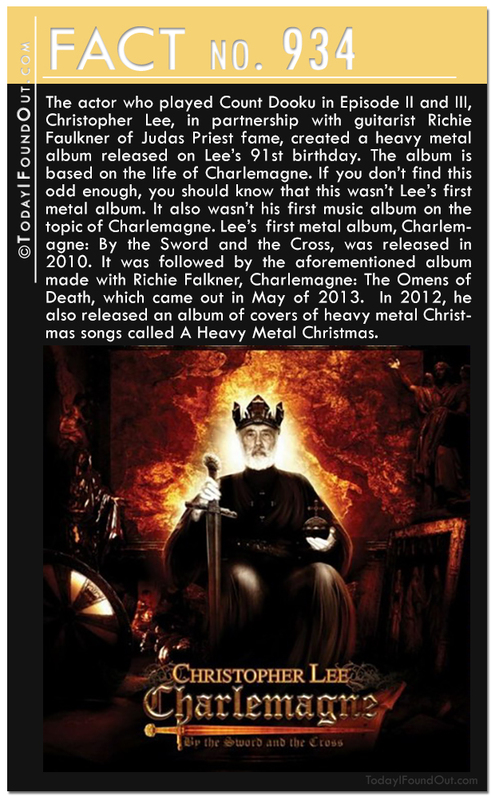 Lee’s first metal album, Charlemagne: By the Sword and the Cross, was released in 2010. It was followed by the aforementioned album made with Richie Falkner, Charlemagne: The Omens of Death, which came out in May of 2013. In 2012, he also released an album of covers of heavy metal Christmas songs called A Heavy Metal Christmas. 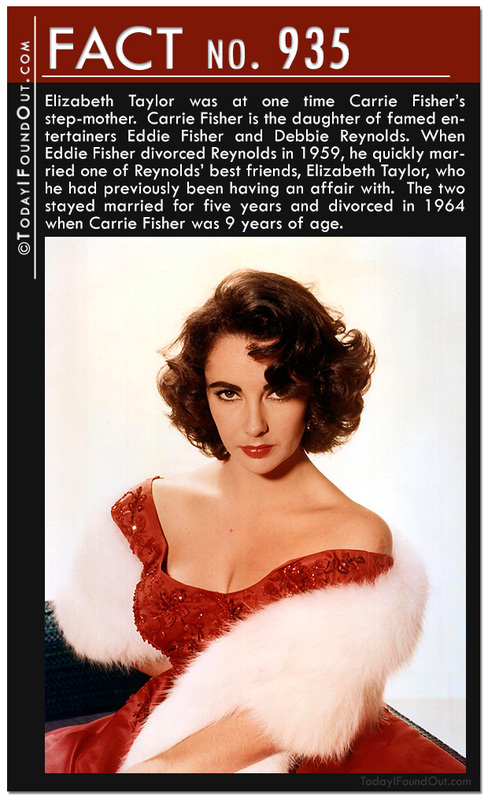 935) Elizabeth Taylor was at one time Carrie Fisher’s step-mother. Carrie Fisher is the daughter of famed entertainers Eddie Fisher and Debbie Reynolds. When Eddie Fisher divorced Reynolds in 1959, he quickly married one of Reynolds’ best friends, Elizabeth Taylor, who he had previously been having an affair with. The two stayed married for five years and divorced in 1964 when Carrie Fisher was 9 years of age. 936) Mark Hamill currently holds the record for playing the Batman character of “Joker” longer than any other actor and in more spinoffs. “I’ve never seen him play the Joker”, you say? It’s because Hamill is one of the more prolific voice over actors in Hollywood, lending his vocal talents to over 100 different characters to date. Among these roles, he has been doing the voice of the Joker on a variety of animated TV shows, movies, and video games for over two decades. He got his start doing the Joker in the Emmy award winning 1992 Batman: The Animated Series. 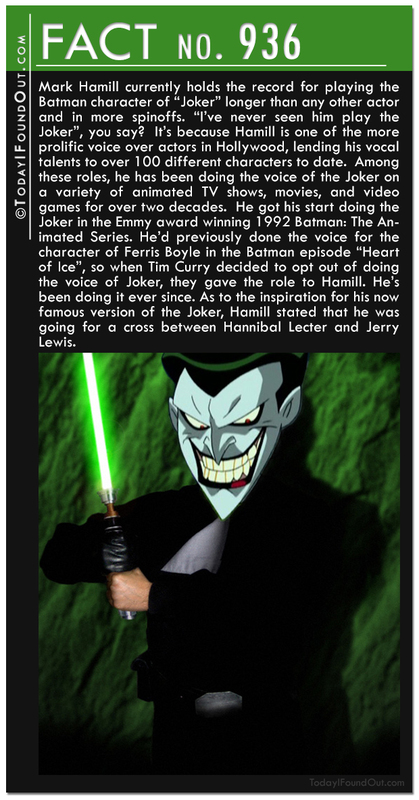 He’d previously done the voice for the character of Ferris Boyle in the Batman episode “Heart of Ice”, so when Tim Curry decided to opt out of doing the voice of Joker, they gave the role to Hamill. He’s been doing it ever since. As to the inspiration for his now famous version of the Joker, Hamill stated that he was going for a cross between Hannibal Lecter and Jerry Lewis. 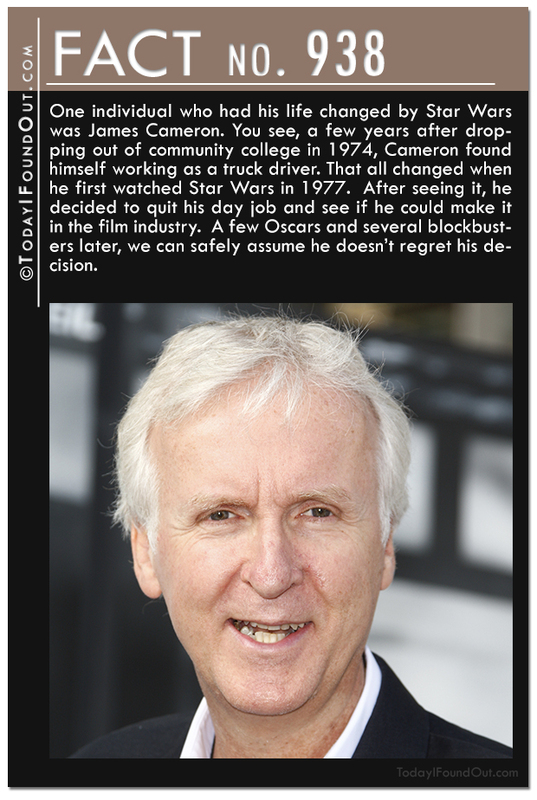 938) One individual who had his life changed by Star Wars was James Cameron. You see, a few years after dropping out of community college in 1974, Cameron found himself working as a truck driver. That all changed when he first watched Star Wars in 1977. 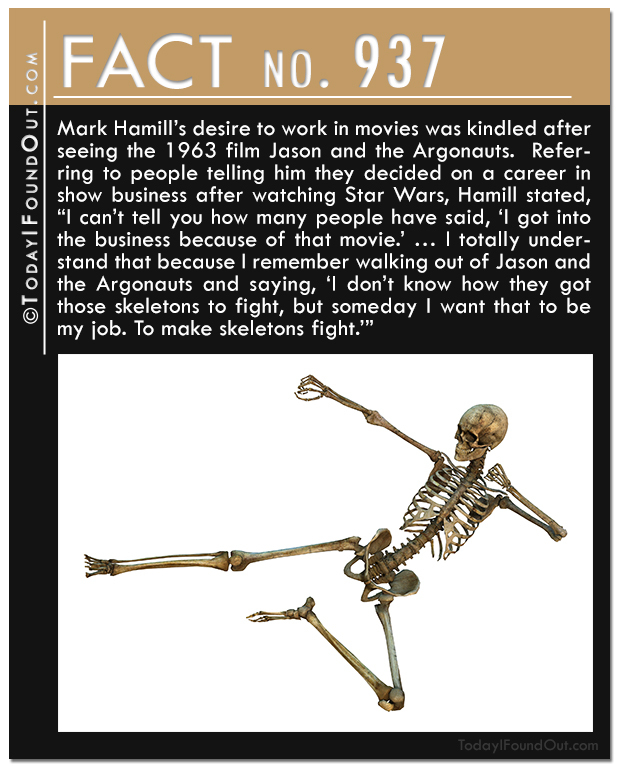 After seeing it, he decided to quit his day job and see if he could make it in the film industry. A few Oscars and several blockbusters later, we can safely assume he doesn’t regret his decision. 939) As many people know, while filming Star Wars: A New Hope, Mark Hamill was in a car accident on January 11, 1977. From here, the myths abound, everything from him nearly losing his life to having massive facial reconstruction surgery. 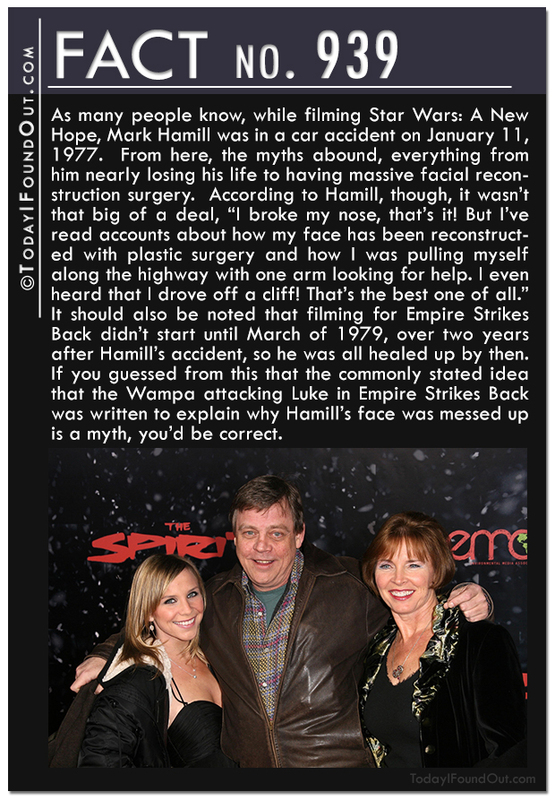 According to Hamill, though, it wasn’t that big of a deal, “I broke my nose, that’s it! But I’ve read accounts about how my face has been reconstructed with plastic surgery and how I was pulling myself along the highway with one arm looking for help. I even heard that I drove off a cliff! 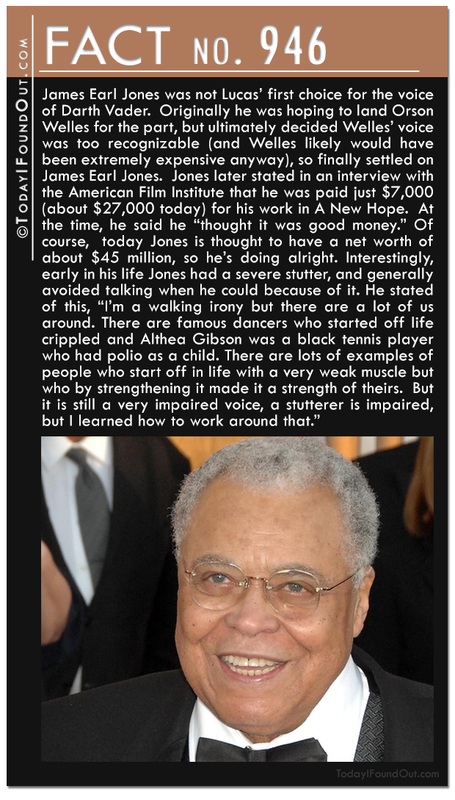 That’s the best one of all.” It should also be noted that filming for Empire Strikes Back didn’t start until March of 1979, over two years after Hamill’s accident, so he was all healed up by then. If you guessed from this that the commonly stated idea that the Wampa attacking Luke in Empire Strikes Back was written to explain why Hamill’s face was messed up is a myth, you’d be correct. 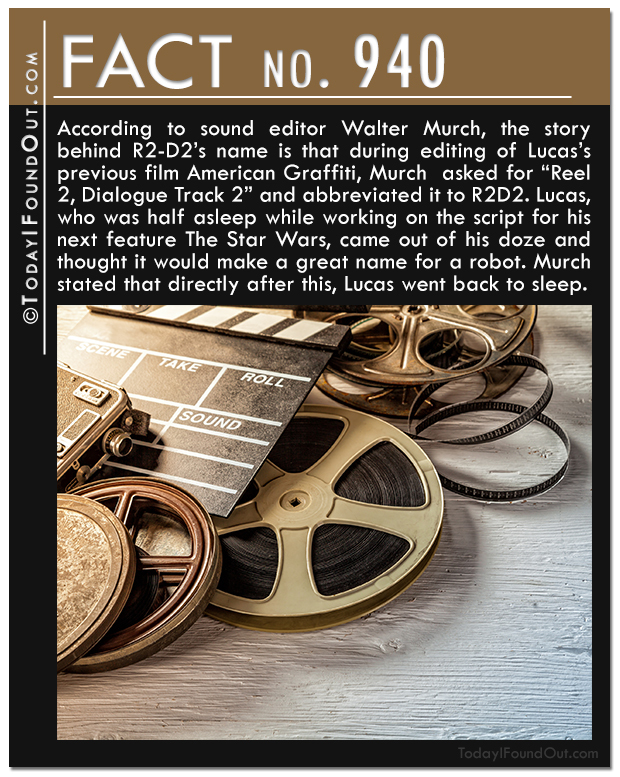 940) According to sound editor Walter Murch, the story behind R2-D2’s name is that during editing of Lucas’s previous film American Graffiti, Murch asked for “Reel 2, Dialogue Track 2” and abbreviated it to R2D2. 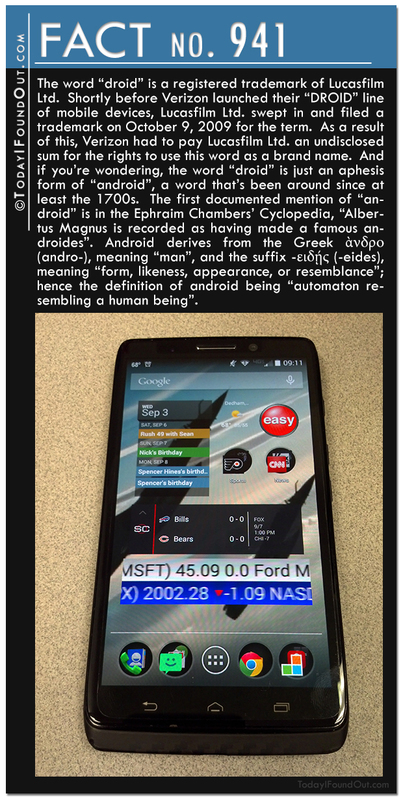 Lucas, who was half asleep while working on the script for his next feature The Star Wars, came out of his doze and thought it would make a great name for a robot. Murch stated that directly after this, Lucas went back to sleep. 942) Many of the droids, including R2-D2 and C-3PO, on Star Wars were designed by legendary special effects man John Stears, a.k.a. “The Dean of Special Effects”. Stears also designed Luke’s landspeeder, the lightsaber, the Death Star, and a variety of other gadgets in the films. 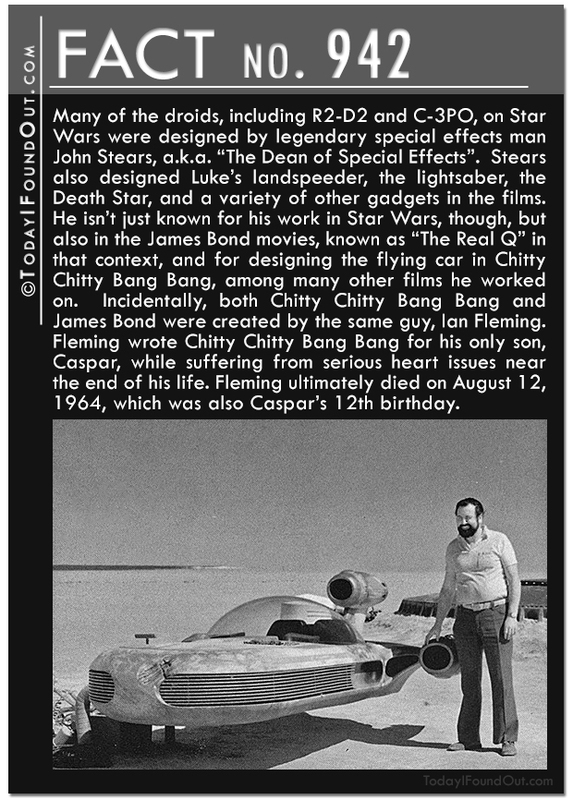 He isn’t just known for his work in Star Wars, though, but also in the James Bond movies, known as “The Real Q” in that context, and for designing the flying car in Chitty Chitty Bang Bang, among many other films he worked on. Incidentally, both Chitty Chitty Bang Bang and James Bond were created by the same guy, Ian Fleming. Fleming wrote Chitty Chitty Bang Bang for his only son, Caspar, while suffering from serious heart issues near the end of his life. Fleming ultimately died on August 12, 1964, which was also Caspar’s 12th birthday. 943) The famous “Star Wars scream”, more properly known as the “Wilhelm Scream”, heard in hundreds of movies, was created via the vocal talents of Sheb Wooley, perhaps better known for his hit 1958 song “Purple People Eater”. The genesis of the scream was that Wooley had an uncredited part in the first film the scream was heard in, a 1951 film called Distant Drums. At one point during the film, Captain Quincy is leading his soldiers through a swamp when one of them gets attacked and dragged under by an alligator, screaming in the process. During post-production recordings, Wooley recorded various vocal sound effects for the film, including a batch of screams. 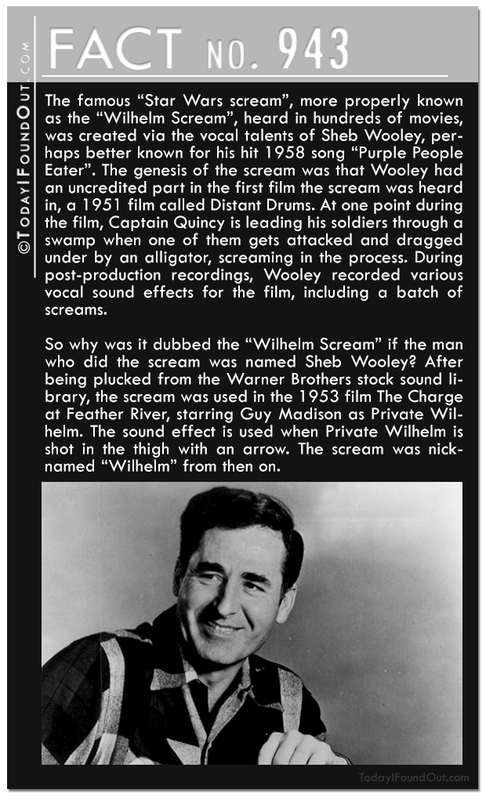 So why was it dubbed the “Wilhelm Scream” if the man who did the scream was named Sheb Wooley? After being plucked from the Warner Brothers stock sound library, the scream was used in the 1953 film The Charge at Feather River, starring Guy Madison as Private Wilhelm. The sound effect is used when Private Wilhelm is shot in the thigh with an arrow. The scream was nicknamed “Wilhelm” from then on. 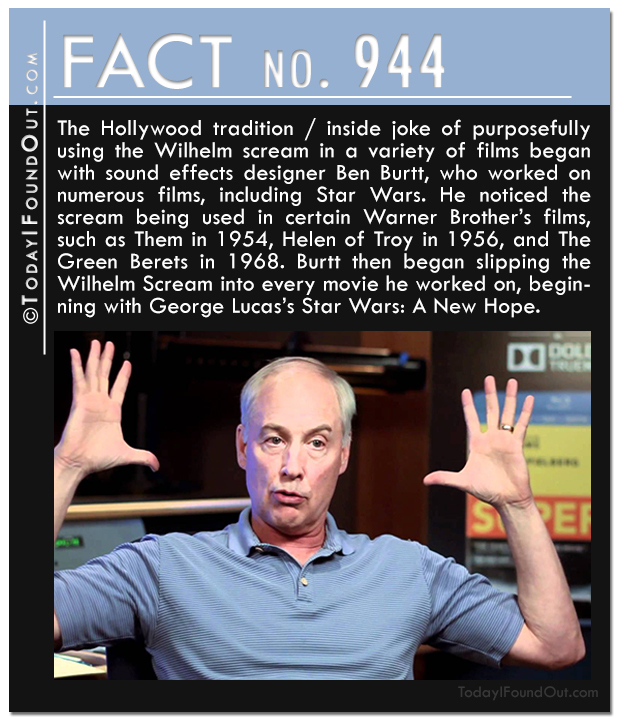 944) The Hollywood tradition / inside joke of purposefully using the Wilhelm scream in a variety of films began with sound effects designer Ben Burtt, who worked on numerous films, including Star Wars. He noticed the scream being used in certain Warner Brother’s films, such as Them in 1954, Helen of Troy in 1956, and The Green Berets in 1968. 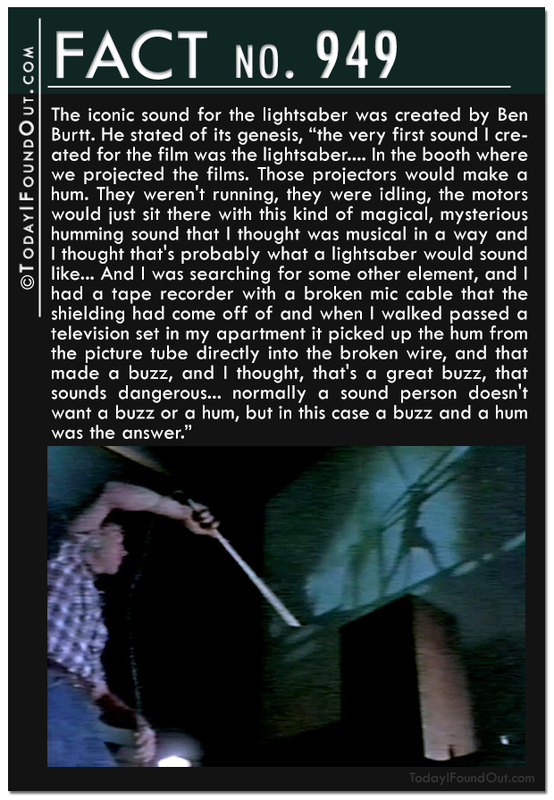 Burtt then began slipping the Wilhelm Scream into every movie he worked on, beginning with George Lucas’s Star Wars: A New Hope. 947) If you’re wondering why early lightsaber battles were quite slow and the characters always kept two hands on the weapon, this is because Lucas was adamant that the lightsabers were supposed to be extremely heavy. Over time, he gradually lessened his stance on this to allow for more elaborate and fast paced duels. 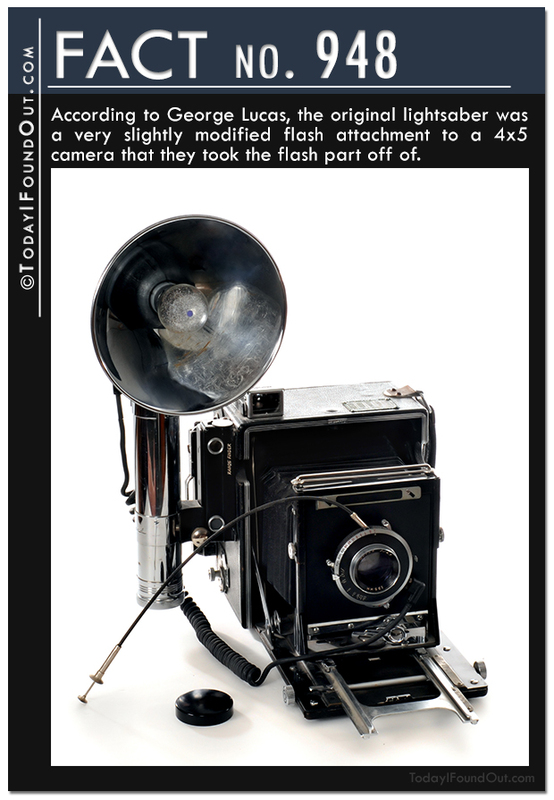 948) According to George Lucas, the original lightsaber was a very slightly modified flash attachment to a 4×5 camera that they took the flash part off of. 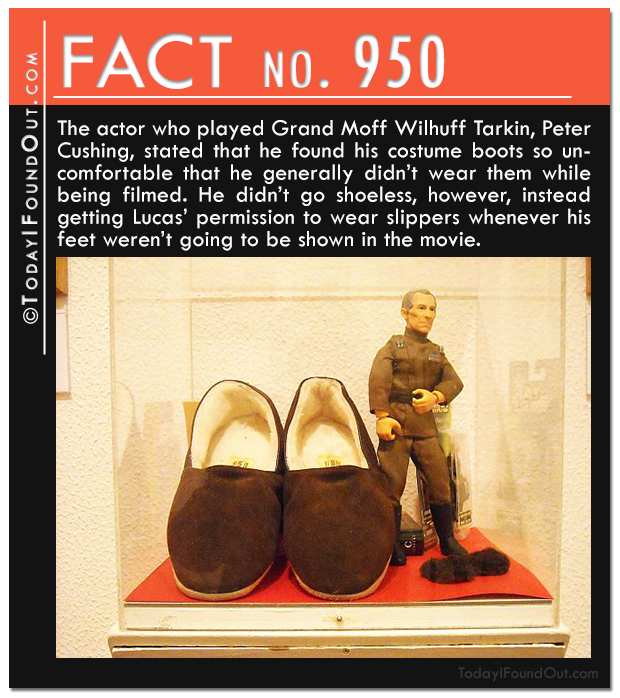 950) The actor who played Grand Moff Wilhuff Tarkin, Peter Cushing, stated that he found his costume boots so uncomfortable that he generally didn’t wear them while being filmed. He didn’t go shoeless, however, instead getting Lucas’ permission to wear slippers whenever his feet weren’t going to be shown in the movie. 951) The actor who played Wedge Antilles, Denis Lawson, has a sister named Carol Diane McGregor. Why is this significant in the Star Wars universe? 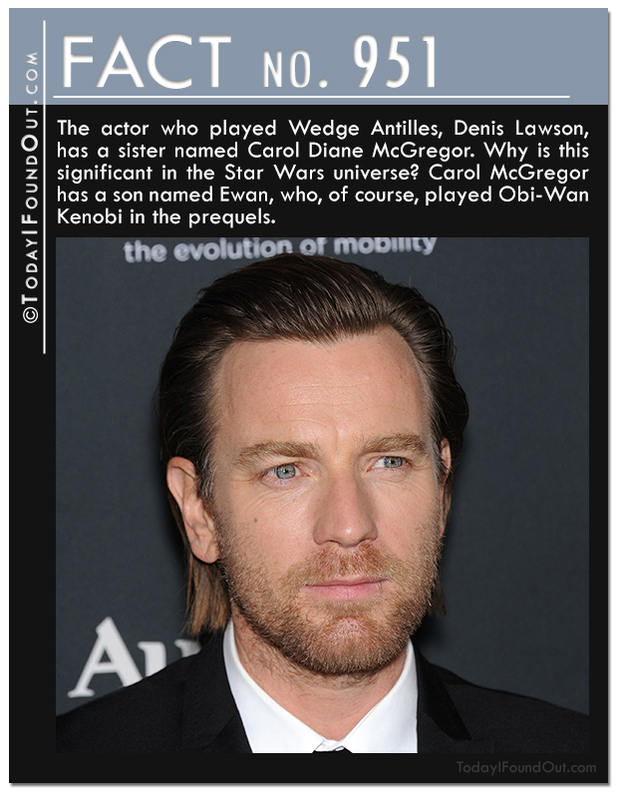 Carol McGregor has a son named Ewan, who, of course, played Obi-Wan Kenobi in the prequels. 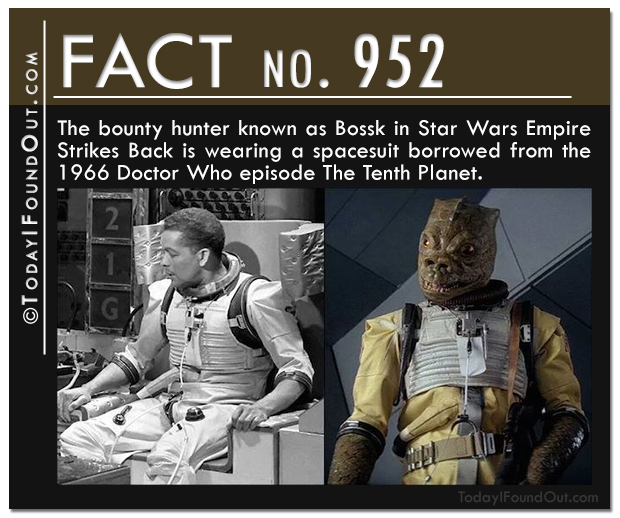 952) The bounty hunter known as Bossk in Star Wars: Empire Strikes Back is wearing a spacesuit borrowed from the 1966 Doctor Who episode The Tenth Planet. 953) Return of the Jedi was at one point called Revenge of the Jedi, including having posters and a December of 1982 teaser trailer, among other promotional materials, made leading up to the release of the film. Because of this, the 1982 Star Trek II: The Vengeance of Khan was renamed The Wrath of Khan. 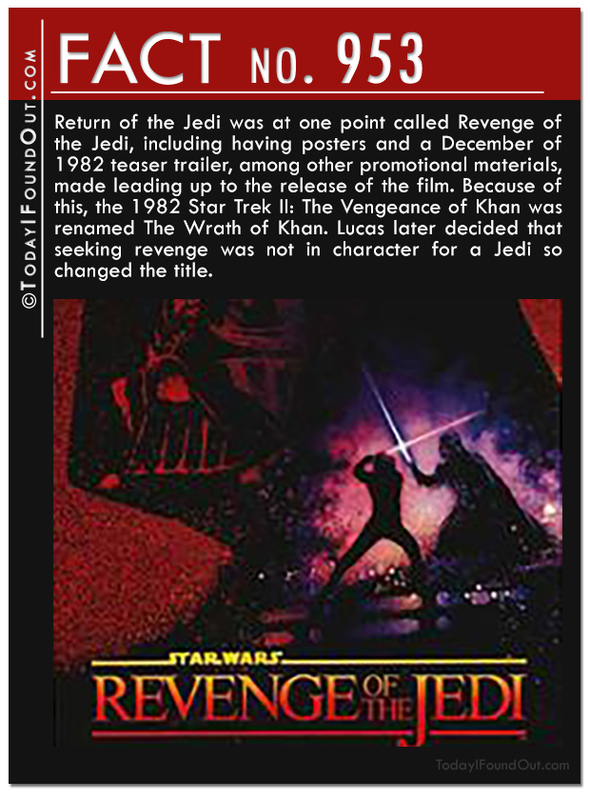 Lucas later decided that seeking revenge was not in character for a Jedi so changed the title. 954) Speaking of the name of episode six, it was originally code-named Blue Harvest to keep people from knowing that what they were really shooting was the third Star Wars installment. Presenting the film as a no-name horror flick not only helped keep gawkers away, but also helped them get better deals when negotiating fees for various locations used for the film. 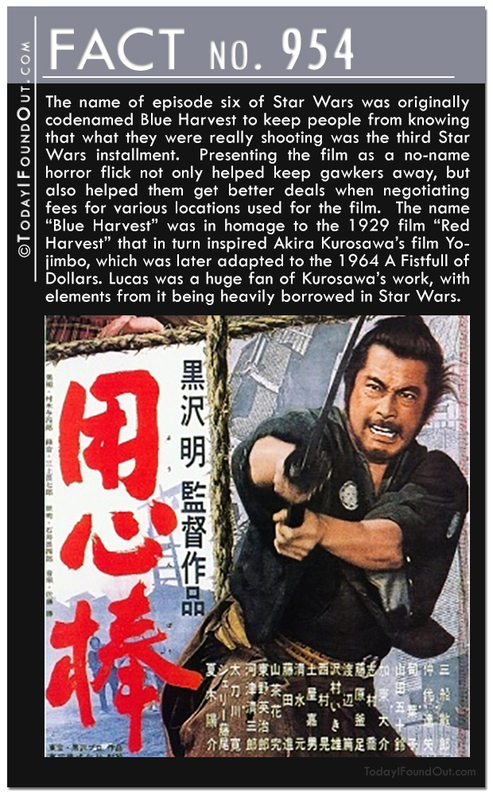 The name “Blue Harvest” was in homage to the 1929 film “Red Harvest” that in turn inspired Akira Kurosawa’s film Yojimbo, which was later adapted to the 1964 A Fistfull of Dollars. Lucas was a huge fan of Kurosawa’s work, with elements from it being heavily borrowed in Star Wars. 955) While Star Wars: The Force Awakens will see a release in just over 4,100 theaters, narrowly beating out The Hobbit: An Unexpected Journey for the widest December release, Star Wars: A New Hope was originally slated to show in only 40 theaters as few theaters were interested in carrying it. 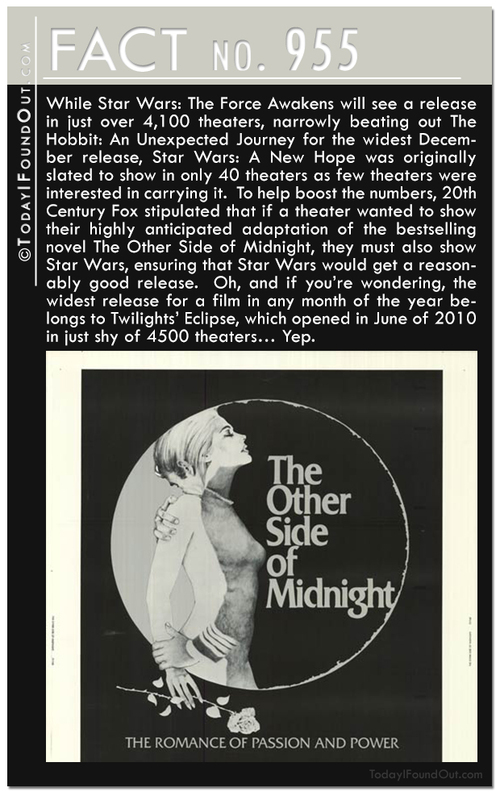 To help boost the numbers, 20th Century Fox stipulated that if a theater wanted to show their highly anticipated adaptation of the bestselling novel The Other Side of Midnight, they must also show Star Wars, ensuring that Star Wars would get a reasonably good release. Oh, and if you’re wondering, the widest release for a film in any month of the year belongs to Twilights’ Eclipse, which opened in June of 2010 in just shy of 4500 theaters… Yep. 956) The giant monster slug, called an exogorth, that tries to eat the Millennium Falcon in Empire Strikes Back was actually just a small hand puppet. 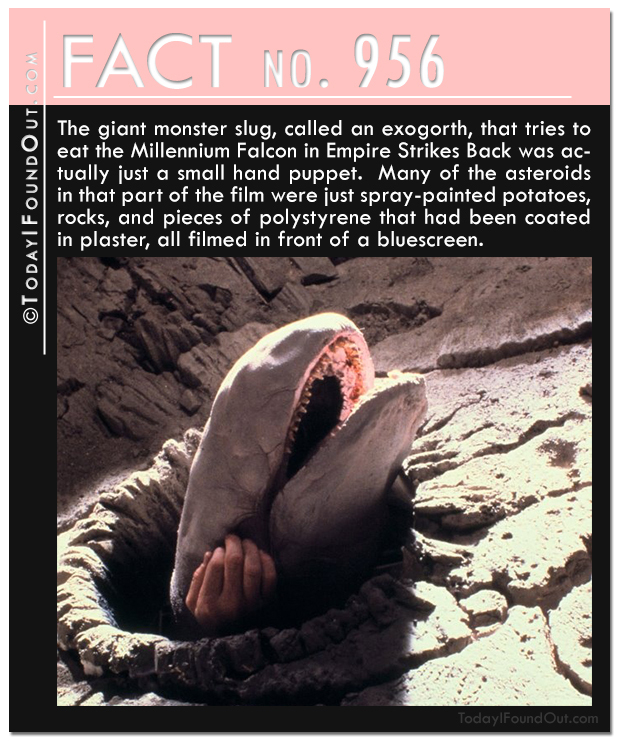 Many of the asteroids in that part of the film were just spray-painted potatoes, rocks, and pieces of polystyrene that had been coated in plaster, all filmed in front of a bluescreen. 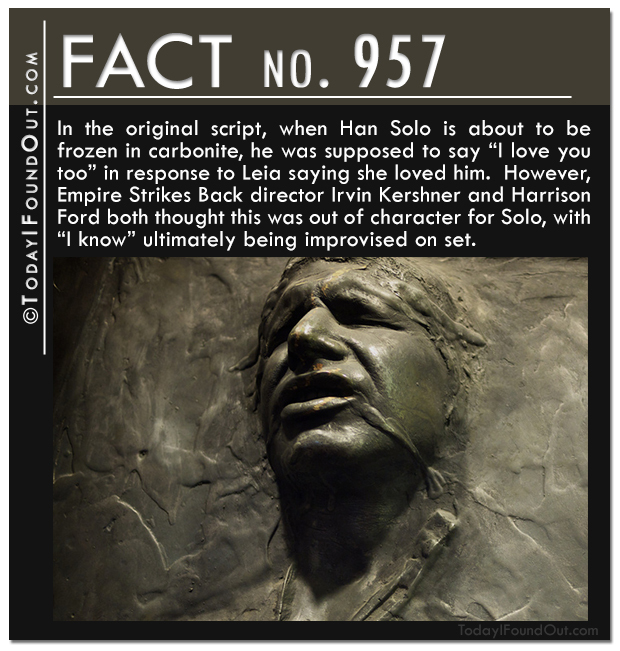 957) In the original script, when Han Solo is about to be frozen in carbonite, he was supposed to say “I love you too” in response to Leia saying she loved him. However, Empire Strikes Back director Irvin Kershner and Harrison Ford both thought this was out of character for Solo, with “I know” ultimately being improvised on set. 958) During filming of the most iconic scene of Empire Strikes Back, where Vader tells Luke he is Luke’s father, the script actually said “Obi-Wan killed your father…” Among the actors, only Mark Hamill was told what the real line would say once James Earl Jones would record it, so that Hamill could react appropriately to the news. Of course, anyone who speaks Dutch could have been tipped off by the spelling of Vader’s name, as “Vader” is Dutch for “father”. Although, the Dutch would pronounce this spelling “fawdder”. 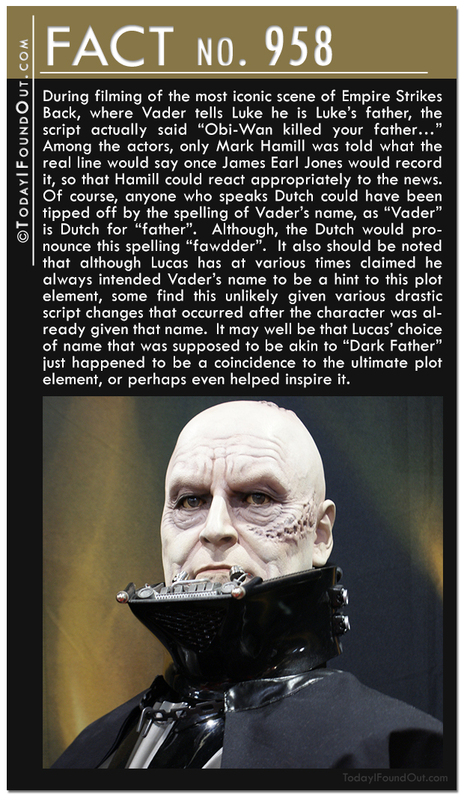 It also should be noted that although Lucas has at various times claimed he always intended Vader’s name to be a hint to this plot element, some find this unlikely given various drastic script changes that occurred after the character was already given that name. 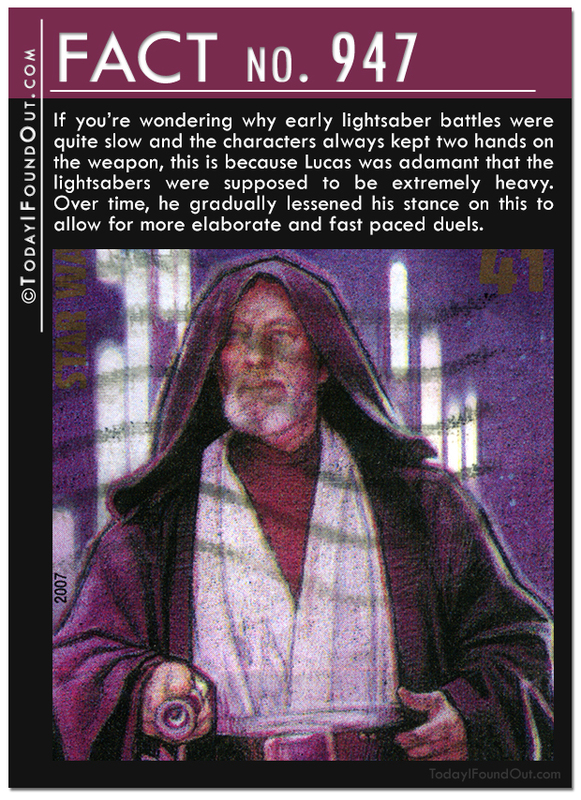 It may well be that Lucas’ choice of name that was supposed to be akin to “Dark Father” just happened to be a coincidence to the ultimate plot element, or perhaps even helped inspire it. 959) The opening of Empire Strikes Back resulted in a huge clash between George Lucas and the respective Writers and Directors Guilds of America, because Lucas refused to put normal opening credits in the film, preferring to just show those afterward like he had in Episode IV. 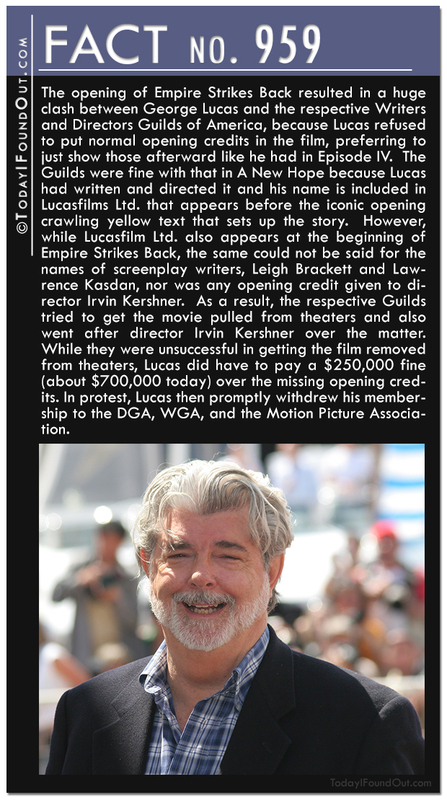 The Guilds were fine with that in A New Hope because Lucas had written and directed it and his name is included in Lucasfilms Ltd. that appears before the iconic opening crawling yellow text that sets up the story. However, while Lucasfilm Ltd. also appears at the beginning of Empire Strikes Back, the same could not be said for the names of screenplay writers, Leigh Brackett and Lawrence Kasdan, nor was any opening credit given to director Irvin Kershner. As a result, the respective Guilds tried to get the movie pulled from theaters and also went after director Irvin Kershner over the matter. While they were unsuccessful in getting the film removed from theaters, Lucas did have to pay a $250,000 fine (about $700,000 today) over the missing opening credits. In protest, Lucas then promptly withdrew his membership to the DGA, WGA, and the Motion Picture Association. 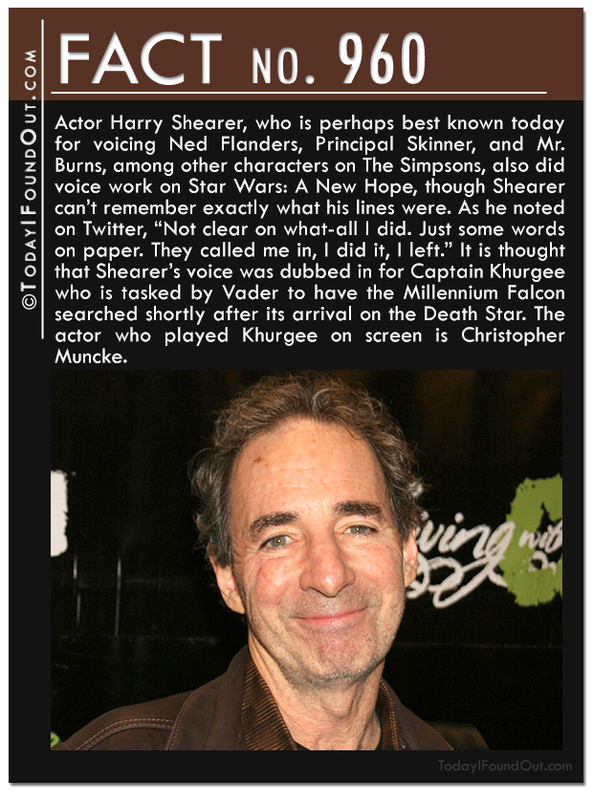 960) Actor Harry Shearer, who is perhaps best known today for voicing Ned Flanders, Principal Skinner, and Mr. Burns, among other characters on The Simpsons, also did voice work on Star Wars: A New Hope, though Shearer can’t remember exactly what his lines were. As he noted on Twitter, “Not clear on what-all I did. Just some words on paper. They called me in, I did it, I left.” It is thought that Shearer’s voice was dubbed in for Captain Khurgee who is tasked by Vader to have the Millennium Falcon searched shortly after its arrival on the Death Star. The actor who played Khurgee on screen is Christopher Muncke. 961) If you thought General Crix Madine’s beard looked fake in Return of the Jedi, that’s because it was. When Dermot Crowley was originally cast as the General, he had a beard, but shaved it off shortly before showing up on the set of Return of the Jedi. 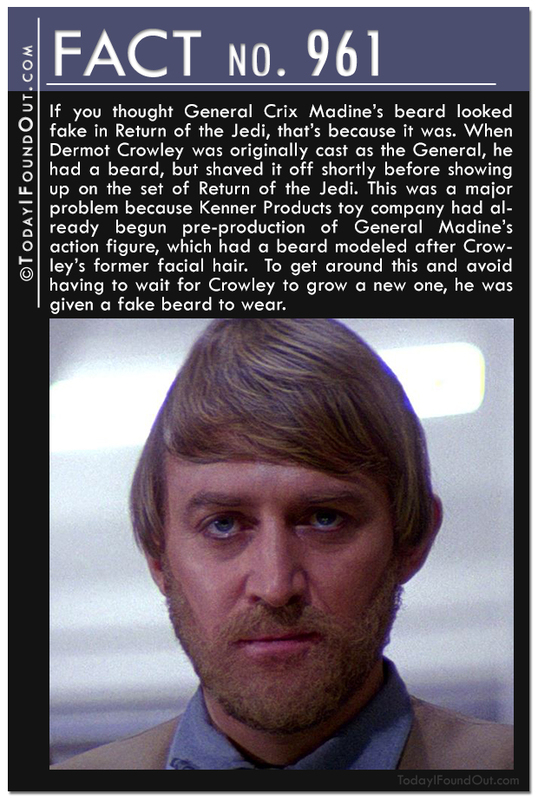 This was a major problem because Kenner Products toy company had already begun pre-production of General Madine’s action figure, which had a beard modeled after Crowley’s former facial hair. To get around this and avoid having to wait for Crowley to grow a new one, he was given a fake beard to wear. 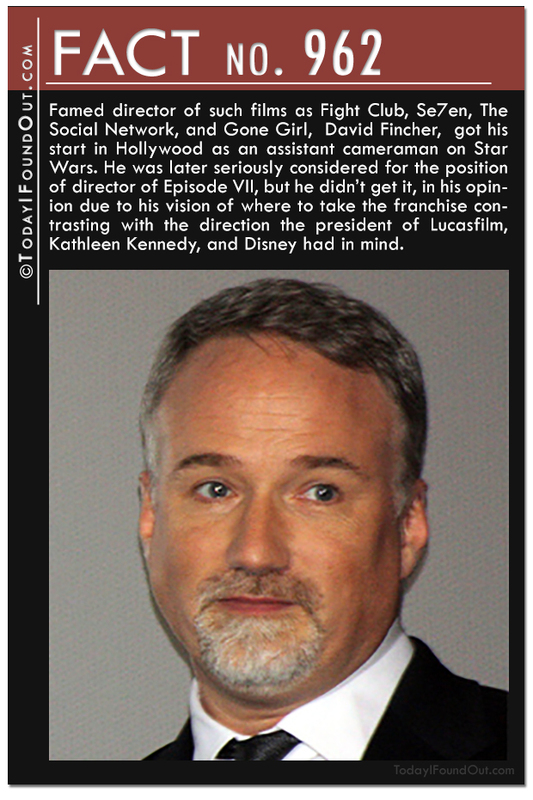 962) Famed director of such films as Fight Club, Se7en, The Social Network, and Gone Girl, David Fincher, got his start in Hollywood as an assistant cameraman on Star Wars. He was later seriously considered for the position of director of Episode VII, but he didn’t get it, in his opinion due to his vision of where to take the franchise contrasting with the direction the president of Lucasfilm, Kathleen Kennedy, and Disney had in mind. 963) Keira Knightley is prominently featured in The Phantom Menace. “Where?” You ask? She played Sabé , Queen Amidala’s decoy, when Natalie Portman was on screen playing her handmade, Padmé. Beyond the heavy makeup Knightley wore in the film to help mask the deception, Portman’s voice was also dubbed in over Knightley’s in the final version of the film.